After a day filled with fun and excitement, once everyone returns to the campsite and starts winding down for the day, telling funny campfire stories is a great way to end the evening. While telling stories around the fire can be very entertaining, sharing funny campfire stories takes a bit of practice with keeping a straight face and perfecting your timing. 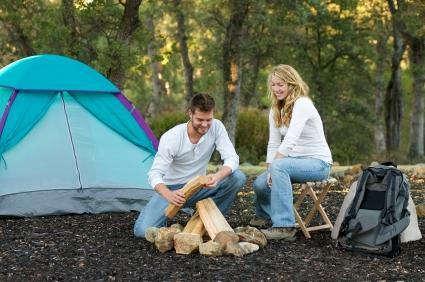 The following stories are a few examples of the sort of funny camping stories you can share around the campfire. One summer, a young newlywed couple went camping in the White Mountains of New Hampshire. The campsite was situated in an area of the national forest called "Crawford Notch." Upon arriving at the Crawford Notch Campground, the couple immediately began setting up camp. Jen started setting up the tent with a certain ease that impressed Robert. Not one to be outdone by a woman, Robert immediately set to work on building a fire - something he'd always been very good at. First, he found a small bundle of dry birch bark and carefully placed it under a small formation of dry twigs placed in a perfect "teepee" structure. Satisfied, he built a three sided "log cabin" of dry larger wood pieces that would easily catch fire once the kindling fire grew large enough. Robert stood up and admired his skillful campfire building work, and then reached into his pocket for matches, only to discover he'd forgotten them at home. Terrified that Jennifer would tease him for making such a ridiculous mistake, he set to work trying to use the magnifying glass in his Swiss army knife to set the kindling on fire with the sun. As he struggled to place the magnifier in just the right position, Jen walked over slowly. "Hey, I can do that if you wanna just set up the stove or..." she began. "No!" Robert yelled, looking up at her with wide eyes. Then, realizing he'd shouted, he looked back down at the magnifier in his hands before continuing, "Making the fire is a man's job. I got it." "A man's job?" Jen responded, raising her eyebrows. "Yeah, yeah...I mean we're programmed for this kind of stuff. Just go, I'm fine, I got it," he answered. Shaking her head, Jen turned and went back to setting up the tent. Robert realized that, because of the clouds, he couldn't get enough sunlight to start a fire, so he searched for a good piece of rough stone. Finding one near the picnic table, he took it to the fire pit and started striking the edge of his knife against the stone, hoping a spark would ignite the dry birch bark. A few times he struck his finger and cursed. Finally, after the third time, he threw the rock across the campsite in frustration. After watching all of this, Jen walked back to the fire pit. "Fine! It's not possible because there are clouds in front of the sun and the bark is far too damp to ignite with sparks, but have at it if you think you're the expert!" Robert shouted and then immaturely crossed his arms, watching her defiantly. Slowly, Jen reached into her pants pocket, pulled out a set of matches, struck one alight and lit the kindling. Three friends, Hank, Thomas and Jim, arrived at the Green Mountain campground in Vermont at 6am on the first day of their planned five-day camping and hiking trip. They allocated who would carry what on the three mile hike to a rustic campground near a waterfall. As they were each lifting the hiking packs onto their shoulders, the glass bottle of juice that was tucked into the side pocket of Hank's pack slipped out and shattered on a rock. "Yeah, I knew that would happen, the bottle was sticking more than halfway out," Thomas said, staring down at the damp earth, as the juice slowly seeped into the ground. Irritated, Hank finished shouldering his pack and headed toward the trail without a word. About two miles into the hike, the three friends came across a fork in the trail. The path that led to the campsite they were headed for was blocked off. "Yeah, I knew that would happen, I saw on the National Forest website that they were doing trail repairs on these trails," Thomas remarked. "Why didn't you mention it?" Jim asked. "I don't know," Thomas answered and shrugged. As they followed the trail to the right, which their map showed would take them on a four mile loop that would ultimately come to the campground where they wanted to camp, it started to rain. "I knew that would happen," Thomas muttered. As they continued along in the rain, Hank slipped slightly on a wet rock and sprained his ankle. As Hank sat on a log on the side of the trail and rubbed his ankle, Thomas stood in front of him with his arms crossed and a grim look on his face. "Yeah, your shoes didn't have good ankle support, I knew that would happen," Thomas mumbled as he stared at Hank's ankle. Finally, after a few minutes of rest, the three unlucky hikers stumbled the remaining few miles to the campsite, only to discover that the rains upstream had turned the campsite beside the waterfall into a flooded area. As the three friends stood at the edge of this pond, staring at the top of the picnic tables jutting out of the water, Thomas started to open his mouth. Hank, who was standing on one foot beside Thomas, grabbed Thomas by the arm and shoved him with all of his might, into the water. Thomas sailed head first into the pond, and as he emerged and stood up, soaking wet, Hank asked, "Did you know that would happen??"